Bookshelf of a bilingual fan of rock criticism? Actually curious what the white elephant is, second from the bottom. Scott — Just discovered your renewal of the rockcritics.com site this afternoon, and I’m glad to see it. We’ve got to do *something* to ameliorate rock criticism’s colony collapse, after all. Like Andrew Hamlin, I’d be glad to make a financial contribution to keep things going, but if you don’t need that right now, I’ll see about contributing rockcrit-survivor comments instead. 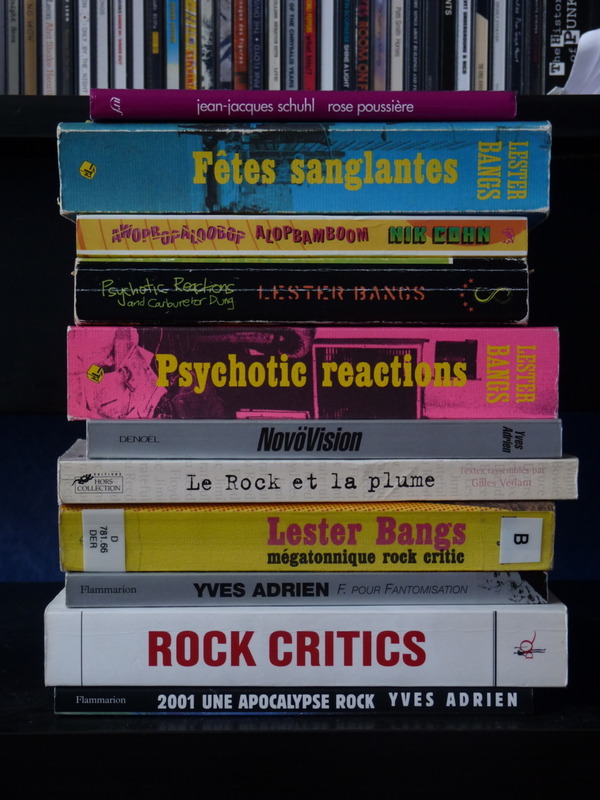 Really love the photo of that stack of Francophone rock books above, including the definitive capsule description of Lester we’ve been searching for all along: “megatonnique rock critic” — Yes!! But do you have any idea whether this Bangs-heavy library was photographed in Quebec, or in the Old Country? Richard, your comments are worth more than gold around here, truthfully (don’t tell Ron Paul, though–he may want a piece of the action here as well). I assumed the photo is Old Country, but it isn’t specified in the source. I recall seeing that terrific “megatonnique rock critic” book elsewhere some time ago, and for some reason I think it was clearly a France and not a Quebec thing, but I could be wrong. I myself am partly bilingual, speaking the King’s English and what I can understand of Marshall McLuhan, but beyond that… not much help! That’s from France for sure. There are very few Quebec-made rock books – the market’s just too small. Even local pop history is severely under-documented – most books are either lightweight celebrity profiles or focus almost exclusively on lyrics. thanks for this, Dave. Wish I could read the thing!